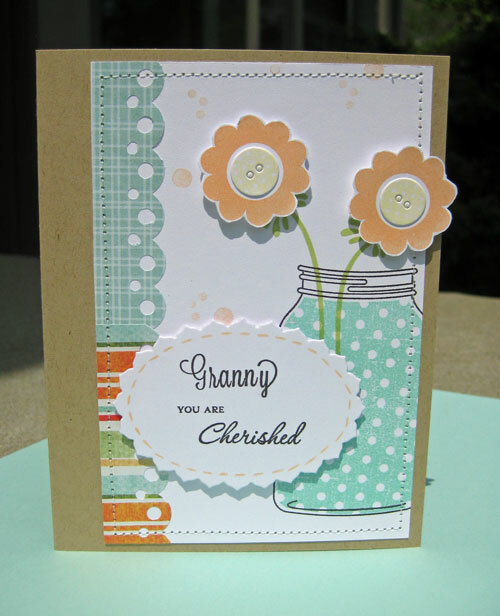 I made this card for my Husband's Grandmother. I mostly copied the design from Michelle Wooderson's beautiful cards. I didn't have a dotted stamp to go around the oval tag so I used a peach colored pencil to drawn in the stitching lines. I cut paper buttons for the flower centers. I just got the most AMAZING alphabet stamp set that I am IN LOVE WITH -- Avery Elle's "Lovely Letters". I just got it, and I used it to stamp "Granny" on the tag. I placed the "y" a little too far to the right, but I'll get better. This set is going to let me customize sentiments so beautifully. There are two lower case y's in the set -- one has a flourish on the end for if you end a word with a y. LOVE! I'm not affiliated with either of those companies, I just love this set. It's hard to find a good alphabet in my opinion! I think if you place the letters even closer together, it looks like a continuous cursive word! Flower Heads: * I hand cut the flower heads but there is a matching die for those I wish I had! !